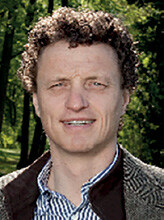 Guido Schmidt-Traub is Executive Director of the UN Sustainable Development Solutions Network. You may follow him on Twitter @GSchmidtTraub. 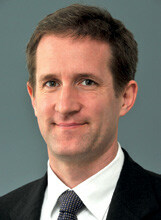 Michael Obersteiner is Program Director of the Ecosystems Services and Management Program at the International Institute for Applied Systems Analysis. Following extensive droughts and a rapid rise in food prices, some of the largest food producing nations, including Russia and Thailand, halted agricultural exports in 2010 and 2011. This led to major upheavals in global food markets. Coming right after food riots in many capitals during the 2008 food crisis, the halting of exports underscored the fragility of today’s food system with potentially deep political ramifications. Indeed, a series of droughts in the Northeast Mediterranean devastated agriculture in Syria and led to at least a million people being internally displaced, which swelled the ranks of the urban discontent and thus helped ignite the 2011 uprising against President Bashar al-Assad. The world is already witnessing increasingly frequent and extreme droughts, as in the summer of 2018 in Australia, and at the same time floods, as with those in southern India. Record numbers of farmers are committing suicide in South Asia, owing to falling income and rising debt levels. These are some of the most visible challenges in the farming sector, and they will place agriculture at the center of campaigns for the 2019 general election in India. The same is happening around the world. The growing impact of environmental change and resource degradation on security, economic prosperity, and social inclusion, has helped develop a global consensus around the 17 Sustainable Development Goals (SDGs) adopted in 2015. The SDGs recognize the importance of sustainable land-use and food systems by setting long-term targets for combating hunger and malnutrition, lowering greenhouse gas emissions, ensuring that water resources are used sustainably, protecting terrestrial and marine ecosystems, and making agriculture sustainable. As part of this universal goal-setting effort, the Paris Climate Agreement commits the world to keeping global warming to “well below two degrees Celsius,” which will require massive changes to land-use and food systems; and the Aichi Biodiversity Targets map out objectives for halting and reversing the loss of biodiversity. Together, these provide a framework of time-bound goals that address all major dimensions of sustainable land-use and food systems. The question now is how these goals can become a reality. Before turning to opportunities for change, it is important to understand why Unilever CEO Paul Polman and many others refer to the world’s food system as being “broken.” The crisis has many dimensions—often invisible and sometimes beyond countries’ own borders—that are rarely connected and mostly underappreciated by governments, business, and the public. It is therefore critical to understand today’s challenges and consider the options for moving towards sustainable food and land-use to advance human wellbeing, sustain economic growth, maintain a healthy and safe environment, and sustain peaceful international relations. The aforementioned challenges are best understood as: (1) an environmental degradation driven by food production and associated land-use change; (2) a health crisis driven by poor nutrition and unhealthy food; and (3) unprecedented vulnerability of the food system to climate change and other environmental changes. These crises are driven by population growth and rising demand for food, feed, fiber, and biofuel. Additional drivers include high food waste and losses in supply chains, poor technological choices, poor or non-existent national policy frameworks, and a lack of effective international cooperation and standards. Food production and the farming of non-food products, such as cotton and biofuels, are the biggest human drivers of environmental degradation in developed and developing countries. Six major dimensions stand out. First, the food system drives land-use change, particularly deforestation in the tropics and land degradation through topsoil loss or salinization. According to the FAO, humans use 43 percent of ice-free land for agriculture and livestock. As the world’s population increases from 7.6 billion to an estimated 11 billion by the end of this century, there will be no room to further expand agriculture without undermining environmental objectives. The problem becomes even more pronounced as per capita demand for meat and dairy products rises, which demands more land and water (through animal feed) than grains or other edible crops. In the process of agricultural expansion, half of the world’s tropical forests have been cleared. Deforestation has slowed significantly over the last 25 years, but more than seven million hectares—an area the size of Ireland—are still deforested each year. Deforestation contributes to unprecedented biodiversity loss at 10,000 times the normal background rate. But since humans have only recorded less than 2 percent of species, there is no definitive way to know how fast the remaining species are being lost. The true number might be far higher. Ecologists warn of a looming sixth mass extinction that will be accelerated by climate change. A second major driver of biodiversity loss is the increased reliance on chemicals to support agricultural intensification. It was recently revealed in Germany that four-fifths of insects have disappeared since the late 1980s. By that time, the country had long shifted to highly intensive agriculture and transformed its virgin forests into farmland and forest plantations. So, the loss of the vast majority of insects is driven by new and more powerful chemicals that are now in widespread use in Europe and elsewhere. We know from world-renowned biologist Edward O. Wilson that life on Earth depends in particular on the “little things” that provide pollination and countless other services. This makes it deeply troubling that even countries with strong environmental protection standards and policies, like Germany, are losing insects rapidly. Third, agriculture, food processing, and the resulting land-use change are responsible for just under a third of global greenhouse emissions. Emissions result principally from deforestation, which releases large volumes of carbon contained in plants and the soil; release of methane, N2O, and carbon dioxide through farming practices; and methane emissions from livestock. A fourth driver of the environmental crisis is unsustainable water use. Agriculture accounts for some two-thirds of water use. Yet, agriculture returns less water to ecosystems than industrial and household use, and irrigation is particularly prevalent in water-stressed regions. As a result, the sector accounts for over 90 percent of scarcity-weighted water use. Agriculture’s unquenchable thirst is leading to the disappearance of the Aral Sea, rapidly falling water tables in many countries, and rivers, such as the Colorado River and increasingly the Yellow River, that no longer reach the sea. With half the world’s population expected to experience high water stress by 2030, water use by agriculture is a major geopolitical concern. Fifth, the food system is responsible for at least three-quarters of nitrogen release into rivers and oceans, which drives the growth of algae and other organisms. When they die, these organisms are decomposed by bacteria, which use up available oxygen in the water. The results are massive algae blooms, as are common off France’s Brittany, along the China seaboard, and the Gulf of Mexico, where they are currently devastating tourism and fishing in Florida. Scientists estimate that the release of reactive nitrogen is already twice the maximum sustainable level. Similar concerns apply to phosphorous, which is used as a fertilizer in many parts of the world. The anoxidization of the oceans is one of the silent environmental crises that has received insufficient public attention. Finally, today’s food system destroys the oceans in ways beyond the release of large volumes of fertilizer. Global warming, caused in part by agriculture, threatens marine ecosystems. Combined with ocean acidification from carbon dioxide and water pollution, climate change has been identified as the principal cause of the 2016 and 2017 mass bleaching events of the Great Barrier Reef, when over 90 percent of the reef was affected and about half the corals died. Humans also catch unsustainable volumes of fish, with a third of commercial fisheries classified as over-fished. In a little over half a century, humans have wiped out 90 percent of the top predator fish, such as tuna, swordfish, and sharks. And destructive fishing techniques like bottom trawling cause massive damage to oceanic ecosystems. Despite the massive environmental costs of food production, today’s food system does not provide adequate and healthy nutrition to many people. Inadequate food has become the leading cause of human mortality. While chronic hunger has declined sharply as a share of the world population, some 800 million people are still undernourished. Over 160 million children under the age of five have stunted growth, in other words their height is too low for their age. Such children usually also suffer from permanent cognitive underdevelopment, which cannot be undone even if nutrition improves at a later age. The causes of undernourishment are complex and include war, poor governance, drought, and other natural disasters. In his analysis of the Bengal Famine, Amartya Sen famously argued that hunger should not occur in democracies, as enough food is produced overall to make up for local shortfalls. This is still the case for the world as a whole, but many victims of hunger are smallholder farmers or artisan fishermen, who do not produce enough food to feed themselves and their families, let alone generate the income to invest adequately in their children. For them, increases in agricultural productivity and improved access to international value chains are a vital step in alleviating hunger. Moreover, many countries, particularly in sub-Saharan Africa, are now major net food importers. When droughts strike, they rely on international support, which has become less available in recent years. Based on guidelines from Harvard nutritionist Walter Willett, the Global Burden of Disease Team, led by Christopher Murray, has compared the food we produce globally with what humans ought to be eating. The contrasts are stark. For example, we produce almost five times too much red meat and about 50 percent too much whole grains and fish. The greatest shortfalls towards a healthy diet are in nuts and seeds, fruit, milk, and vegetables. These discrepancies between healthy and actual diets are even more extreme in some regions and countries. The results of unhealthy food are alarming. Over two billion people are overweight or obese. A third of Americans are obese, and rates in the UK and other parts of Europe are not far behind. Obesity is widespread in the Gulf countries, but also in countries that are still home to many poor people, including Mexico and South Africa. Obesity is a public health crisis that leads to 2.8 million premature deaths each year through cardiovascular diseases, Type II diabetes, cancer, and other health risks. An estimated 41 million children under the age of five are now overweight. The inadequate food produced by our food system also causes two billion people to suffer from micro-nutrient deficiencies. Causes include insufficient consumption of vitamins or trace minerals, such as iron or zinc, which are critical for the growth and sustenance of body and mind. Though such deficiencies rarely produce visible signs of ill health, they can have severe consequences on human well-being, reducing productivity and life expectancy. Pregnant and breastfeeding women who suffer from micro-nutrient deficiencies threaten their own health and may cause permanent damage to their children. In addition to generating poor health outcomes and environmental degradation, the food system is also uniquely vulnerable to global warming and other environmental changes. Every decade sees global warming push climate zones towards the poles by over 50 kilometers. This puts agricultural zones, particularly in warmer climates, under increasing pressure, with average yields projected to fall sharply under what scientists call a business-as-usual scenario, i.e. a scenario characterized by a lack of strategic policy changes across the globe. Some regions, particularly in tropical and arid zones, are expected to suffer significant agricultural productivity losses, though their exact magnitude remains difficult to predict. At the same time, global warming increases the frequency and severity of extreme weather events. These include droughts, storms, and floods. As a general rule, under global warming, dry places will get dryer and wet places will become wetter, with rains falling with far greater intensity. Over the last decade, Australia, the Mediterranean Region, Russia, and the western United States have all experienced the worst droughts in living memory. This year, agriculture was devastated in southern India and Japan as a result of the worst floods ever. Moreover, the changing climate will disrupt pollination services provided by insects. It is difficult to project likely impacts, but several studies predict disruptions of fruits, nuts, and other crop harvests. Changing agricultural pests in response to climate change will further threaten yields. In addition, soils are being degraded around the world through inappropriate farming practices, water logging, saltwater intrusion, and topsoil loss. 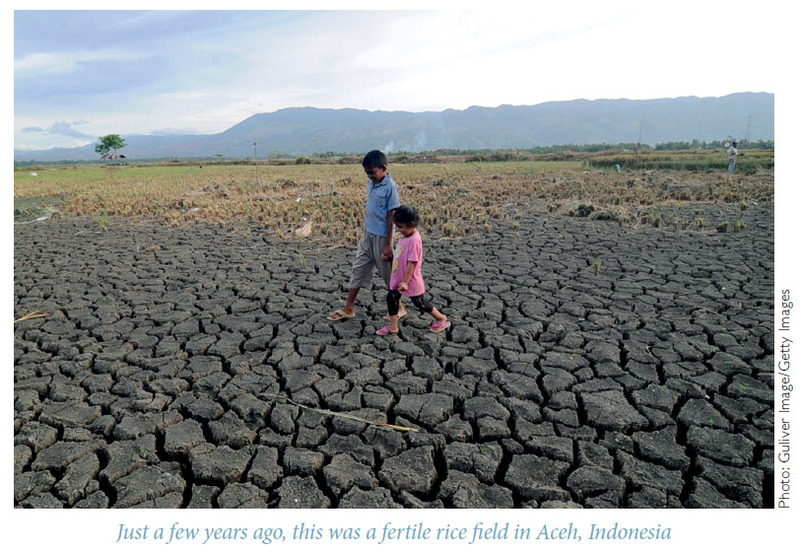 Land degradation is already affecting a quarter of agricultural land around the world. And chemical pollution affects living organisms and soil productivity in ways that we still poorly understand. A different form of vulnerability derives from decarbonizing energy systems. Many pathways towards net zero greenhouse gas emissions from energy presented by the Intergovernmental Panel on Climate Change (IPCC) recommend a massive expansion of power generation from biofuels—sometimes in conjunction with carbon capture and storage. If implemented, such strategies would add to the pressures on land-use and food systems by increasing demand for agricultural land, irrigation water, and chemical pollution. Today’s food system is not fit for purpose. It generates poor health outcomes, drives massive environmental degradation, and is itself vulnerable to climate change. Growing food demand, through population growth and increasing affluence, compound the crisis. Under the business-as-usual scenario, countries will experience more frequent and severe shocks than the food crises of 2008 and 2010–2011, and they will neither achieve the Sustainable Development Goals nor meet the objectives of the Paris Climate Agreement. Food systems are highly location specific, steeped in historical traditions, and secure the livelihoods of hundreds of millions of smallholders and other farmers. They are complex and shaped in part by external drivers, such as urbanization, industrial and infrastructure development, and of course climate change. So, strategies to address the challenges must integrate across agronomy, ecology, hydrology, climatology, economics, infrastructure engineering, the social sciences, and, of course, local politics. And yet, even the most advanced countries do not have policies that integrate across agriculture, health, biodiversity, water, and climate change. Even worse, they lack the analytical tools to understand the complex synergies and trade-offs across these areas and to determine, which short-term measures must be undertaken in order to achieve long-term objectives. In short, governments around the world are largely flying blind, not knowing how to make their food and land-use systems sustainable. Many undertake isolated measures, but these do not add up to a strategy. In response to this crisis, businesses, civil society organizations, researchers, and international organization have come together to launch the Food and Land-Use Coalition. This coalition aims to draw greater political attention to the challenges of land-use and food systems, promote integrated strategies, and mobilize action. It includes the Food, Agriculture, Biodiversity, Land-Use, and Energy (FABLE) Consortium, a global network of several dozen research organizations from over 20 developed and developing countries, including the European Union, which develops tools and analyses for integrated land- and water-use planning (Figure 1). This consortium is led by the UN Sustainable Development Solutions Network (SDSN) and the International Institute for Applied Systems Analysis (IIASA). General Eisenhower famously declared that all plans are useless, but planning is everything. This philosophy needs to be applied to land-use and food systems. Countries need to develop rigorous, integrated long-term strategies across agricultural production, environmental protection, health, as well as water and land use. Just as it is impossible to design and implement economic policies without sound macro-economic models, countries will not be in a position to make their land-use and food systems sustainable without robust tools to model the impact of policies. Such integrated planning approaches for land and water use must be geo-spatially explicit to identify land-use conflicts and develop ways to manage them. Similarly, water use must be understood and managed across all users at basin levels. So, the analysis must extend beyond the food system to include infrastructure, industry, urban development, and energy, which all drive changes in land and water use. The resulting strategies need to be discussed across all relevant branches of government, with business and civil society, in order to tap into expert knowledge and ensure buy in. Integrated planning of land and water use should not be confused with central economic planning à la GOSPLAN under the USSR. The idea is not to centrally plan economic production, but instead to develop a shared framework for managing trade-offs and synergies in the use of these limited resources. In fact, local and multinational businesses need such long-term frameworks to operate effectively. For example, Sunny Verghese, the head of Olam, one of the world’s largest traders in agricultural products, calls on governments to undertake integrated land-use planning. Brazil provides interesting lessons for how such an approach might be put into practice. Over the past decade, Brazilian government research institutes IPEA and INPE have worked with IIASA and local partners to implement a geo-spatial model of land-use and food systems in Brazil. With the help of this model, one can project the impact of different policy measures, such as the Forest Code, on food production, deforestation, biodiversity loss, and many other dimensions. This analysis demonstrated the feasibility of greater ambition on reducing deforestation without compromising other policy objectives, which in turn allowed Brazil’s then-president, Dilma Rousseff, to make the zero-deforestation pledge, providing critical momentum to the successful Paris climate conference. The model is also consulted in the design of new policies, and results are reviewed by ministers in the climate change committee to ensure integrated and coherent policy making across ministries. Unfortunately, the new Brazilian government has reversed many of the pledges, and deforestation rates in the Amazon and elsewhere are once again rising. The Brazilian experience is not a success story, but it points towards a way out of the crisis. 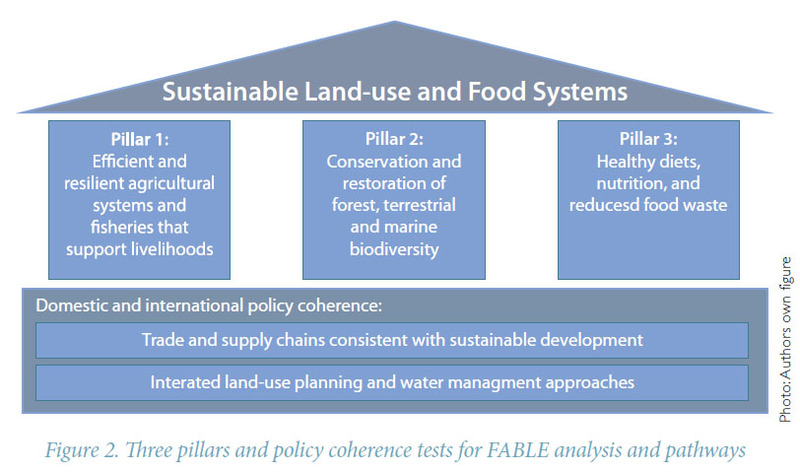 To promote integrated approaches, the FABLE Consortium has identified three pillars for achieving sustainable land-use and food systems (Figure 2). Pillar 1: Efficient and resilient agricultural systems and fisheries that support livelihoods. Agricultural production systems need to be intensified to reduce pressure on land, but such intensification must be sustainable. This will require inter alia major yield improvements, greater resource use efficiency—in terms of nutrients, water, greenhouse gas emissions, chemicals, and the reduction of post-harvest losses—as well as system redesign for the sustainable management of pests, but also pollination services, water, and other forms of natural capital. Bespoke strategies are needed for major cropping systems (e.g. maize, wheat, rice, soy), livestock, aquaculture, fisheries, forestry, and biofuel production. As part of sustainable intensification, agricultural practices must become more compatible with protecting biodiversity through intercropping, agroforestry, creating small biosphere reserves, more careful use of chemicals, and other measures. In some areas, such measures have been shown to increase agricultural productivity, but it is likely that the highest yields generated through industrial farming may need to come down slightly in order to reduce adverse impacts on biodiversity and environmental resources. This won’t necessarily reduce farmers’ incomes if coupled with measures to change diets that may increase the price of some agricultural products. Current trends are insufficient for achieving the massive improvements needed, which means that innovation must be accelerated. Unfortunately, today’s innovation system is poorly designed to meet this challenge. As an example, Silicon Valley venture capital firms devote only a small share of their investments to agriculture and the food sector. Yet, some 80 percent of such limited resources flow into food distribution companies, as opposed to food production, where the greatest need for innovation is. This suggests that greater investment in public-private mission-driven innovation systems is required, as argued persuasively by scholars Richard R. Nelson of Columbia University and Mariana Mazzucato of University College London. A particular focus of innovation in food and other agricultural production systems must be placed on ensuring greater resilience to climate change. Otherwise, livelihoods of smallholders and other farmers will be subject to ever rising shocks. Strategies must include improved water management infrastructure and systems, drought and heat-resistant crops, and improved farming methods. A large number of policy tools, including market instruments, regulation, voluntary industry standards, and taxation can be deployed to render production systems sustainable. International coordination will be key, particularly within international supply chains, which aren’t currently designed to tackle the challenges of increasing productivity, reducing resource use, and rising resilience to climate change. Creative ideas are needed regarding ways that producers, distributors, and retailers in each major value chain can come together to tackle these challenges and propagate learning across the value chain. This calls, in particular, on the large food companies that sit at the top of these value chains to become more engaged. Pillar 2: Conservation and restoration of forests, terrestrial and marine biodiversity. Forests, soils, peatlands, wetlands, savannahs, and coastal marine areas all deliver vital ecosystem services, such as water management, soil management, clean air, carbon storage, pollination services, and many more. Yet, under a business-as-usual approach we are likely to lose most remaining areas of wilderness over the course of the twenty-first century, while deforestation continues to threaten Earth’s essential systems. Collective action is thus needed to halt the loss of terrestrial and marine biodiversity, including forests, through improved conservation and large-scale restoration programs. The world has witnessed many successful conservation programs, but overall the scale and effectiveness of these measures is too limited. Bold policy action is required to stop unsustainable practices, such as Indonesia’s recent moratorium on peatland conversion. But, of course, fence-and-fine approaches do not work, so conservation measures must be designed and implemented in cooperation with local communities. The same applies to large-scale restoration programs and measures to increase soil fertility and capture more carbon in the biosphere. Pillar 3: Healthy diets, nutrition, and reduced food waste. Food insecurity and hunger need to be alleviated by making investments through complementary safety nets and targeted interventions. Most countries must shift consumer demand towards healthier diets. In particular, this requires a shift away from red meat, which contributes to poor health and requires vastly more water and land to produce the same nutritional value. For example, China has adopted ambitious goals to halve per capita meat consumption. Some countries have begun to tackle excessive sugar and grain consumption, e.g. through taxes on soft drinks. Other countries need to follow suit and work with businesses and civil society on the complex issue of how consumer behavior can be changed. This will require deep changes in food distribution and marketing, but they are vital to safeguard human health and make food and land-use sustainable. Once more, innovation will be a big part of the answer. New technologies for making plant protein that resembles meat or growing meat directly from plant-based protein can reduce the environmental footprint of the food system without requiring deep changes to consumers’ eating habits. We need to invest more in such novel approaches and determine how new technologies can benefit consumers in all countries. Another priority is to reduce food waste, which currently accounts for up to a third of food produced on farms. France has made significant inroads into curbing food waste, and we are beginning to understand how smaller packaging sizes, improved marketing, and better supply chain management can make our food systems less wasteful. New approaches to converting food waste into edible proteins, such as “insect burgers,” provide another promising avenue to lessen pressure on food production. Organizations like EAT or the Barilla Food Forum are working with companies to develop and promote innovative approaches. Land-use and food systems are unsustainable and highly vulnerable in virtually every country. The challenge defies easy answers or silver bullets, so governments, business, and civil society must all take urgent action. This urgency applies to both short- and long-term measures, which must be pursued simultaneously. When a country faces an emergency, it may be counter-intuitive to call for long-term measures, but this is precisely what is needed to promote sustainable land-use and food systems. Over the short-term, countries need to fix policies, improve standards, mobilize greater investments, and mobilize stakeholders. With a longer-term perspective, they need to develop and consult on long-term pathways towards sustainable land-use and food systems, invest in long-term technology development, and undertake the institutional reforms needed to promote policy coherence across the whole of government. A long-term focus is equally necessary to ensure that international supply chains and trade flows become consistent with sustainable development. The next two years provide important international opportunities to accelerate the shift towards sustainable land-use and food systems: in September 2019, the United Nations will host a summit at the head of state or government level to review implementation of the SDGs five years after their adoption. This “SDG Review”, and the preparations leading up to it, is an occasion to engage world leaders on the practicalities of shifting towards sustainable land-use and food systems. It also provides an opportunity to share lessons across countries. The year 2020 is a make-or-break year for land-use and food systems. China will host the 15th conference of parties of the Convention of Biological Diversity, which is charged with adopting a new goal framework for biodiversity. To date, international goals have largely failed to slow the loss of biodiversity, so this conference is seen by many as the last chance to prevent the loss of key ecosystems and biodiversity hot-spots. China’s rapidly growing environmental footprint affords the country a central role in international efforts to halt the loss of biodiversity. If the government commits itself to an ambitious outcome, then this conference of parties may prove to be a watershed moment in international efforts to conserve and restore biodiversity. Finally, by 2020, countries have committed to submitting “long-term low-emission development strategies” to the UN Framework Convention on Climate Change under Article 4.19 of the Paris Climate Agreement. Such strategies must be integrated and must address food security, deforestation, biodiversity loss, unsustainable water management, and other non-climate dimensions of sustainable land-use and food systems. If countries follow through on this pledge, by 2020 they will have the long-term pathways in place to revise shorter term climate policies—the Nationally-Determined Contributions—in line with the SDGs and the objectives of the Paris Climate Agreement. This is how 2020 can lead to change in international efforts to curb human-induced climate change. There is no time to lose. In the work we have been conducting throughout dozens of countries, we have experienced a growing awareness and readiness to undertake the deep changes required to make food and land-use systems sustainable. If we apply ourselves to this complex challenge, there is no doubt that it can be mastered and overcome. 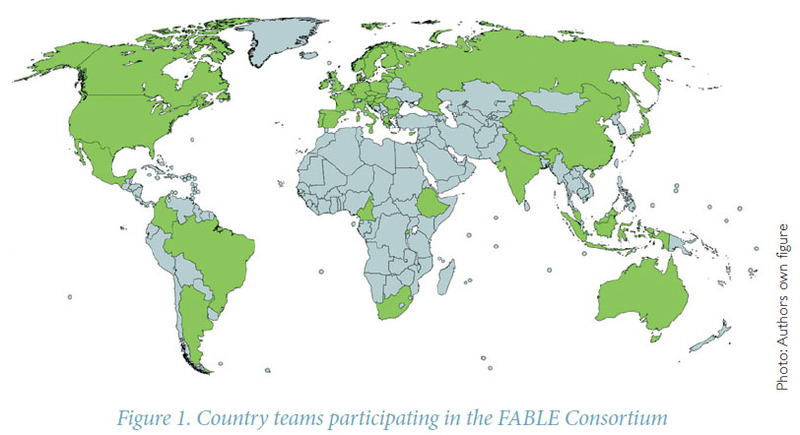 By promoting practical solutions, the Food and Land-Use Coalition and members of the FABLE Consortium hope to contribute to meeting the SDGs and the objectives of the Paris Climate Agreement.